Cyclear ™ enhances the safety and wellbeing of vulnerable road users, drivers and vehicle operators by preventing accidents and fatalities. The system has been designed, manufactured and tested in the UK by Innovative Safety Systems Ltd (ISS), a leading provider of vehicle safety equipment. Cyclear is being demonstrated on the ISS Stand (5X100-Y111) at the Resource Efficiency & Waste Management Solutions Show at the NEC (16-18 September 2014). A 3-stage system, Cyclear works by: 1) preventing cyclists from travelling down the side of vehicles when they are turning left via a sign that illuminates when the vehicle is indicating left; 2) warning cyclists again with an audible warning announced through a speaker on the vehicle; and 3) by detecting when a cyclist is travelling from the rear to the front of the vehicle (undertaking) and alerting the driver inside the cab with an audible warning. Another great feature of Cyclear is that vehicle operators can choose whether to use either the illuminated sign or the sensor or both depending on specific requirements and budget. 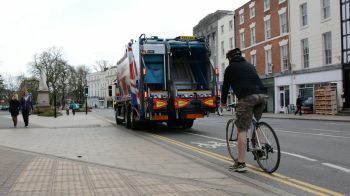 Four years in development, and following successful tests of the prototype, Cyclear has been adopted by a number of authorities including Guildford Borough Council and the London Borough of Sutton. From Autumn 2014 Serco is fitting Cyclear technology to all waste vehicles in the London Borough of Havering. A one-stop shop for vehicle safety technology ISS will also be demonstrating the LANlink remote download facility, which saves vehicle operators time by downloading recorded camera footage from vehicles by wifi as soon as they return to the depot. The system also sends an automatic daily health report for each camera and recording device alerting the operator of any faults immediately. The company also supplies, installs and maintains the full range of safety and lighting products including reversing radars, CCTV camera systems, Hard Disk Recording, warning beacons and LED lighting packages. ISS has seen impressive growth over the past 12 months and has recently relocated to larger, fit for purpose premises, featuring a state of the art showroom to demonstrate its market leading technology, and providing excellent meeting facilities for its customers.